High Tech Tools to Enable School Students to Speak with Orangutans | Collaborate for Change! « The Return of Hope – How our Schools can Become the Most Empowering Places on Earth! Imagine if young people from across the planet could log into their PCs and start a face to face chat with a real orangutan, where technology acted as a translator, allowing these young people to understand exactly what the orangutans were trying to say. What might students learn from these amazing ‘people of the jungle’, particularly as they gain an appreciation of their intelligence and personality by engaging with animals for the first time ever via meaningful dialogue or complex games? What kind of respect might students develop for other species when they are beaten by them in memory games or other challenges that orangutans excel at? Could young people build meaningful relationships, even friendships with orangutans, while sharing information about how they view the world? The answer is YES, and this is exactly what the DeforestACTION team are putting together, based on another of the inspired ideas of Dr.Willie Smits. The first step has been to install some state of the art multi-touch Windows 7 machines (housed in high impact resistant frames and cases) for the orangutans to use. This is nothing new. The Georgia Zoo in Atlanta has been experimenting with touch screen games, interactions and menu selection for orangutans for years. On the other side, students from across the planet will be able to log into a Windows 7 app, either on their PC or Smart Phone, and sign up to meet or play against an orangutan. In simple memory games (e.g. flipping pairs of cards over to match up like cards), orangutans have a far better memory than most humans, so in playing these primary school type games, students (and adults) will typically lose. To truly make connections, we need to be able to read the facial expressions of the people (or animals) we are engaging with. Humans are born with an incredible ability to decode many thousands of facial expressions in other humans. A significant portion of the brain is dedicated to exactly this function. In fact, most communication experts believe over 90% of our communication occurs through body language and facial expression decoding. What humans can’t do at all well is interpret facial expressions of other animals, including orangutans. One of the most exciting developments in this project, is the adaption of some of the work being done by Professor Paul Ekman, who has been researching the link between emotions and facial expressions. Software built on Ekman’s Facial Action Coding System (FACS) can taxonomize every human facial expression and convert them to animated format – this is used in movies like Avatar and other animated movies to ensure the characters we see on screen reflect the personalities behind the animations – think Mike Myers in Shrek. Using new software to be released on the DeforestACTION site later this year, it will be possible for avatars to translate the emotions of orangutans into human terms in real time using avatars. 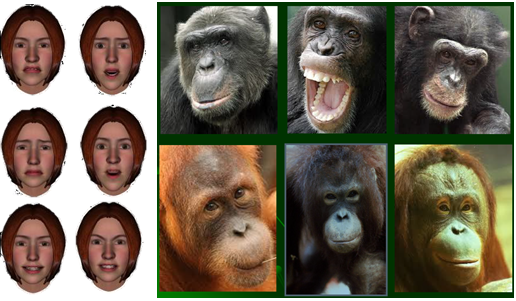 This will use Enkman’s FACS technology mapped against orangutans (who also exhibit thousands of facial expressions). Students can understand the facial expressions and emotions of orangutans via avatars as they befriend them online. So, students will know if an orangutan is smiling, laughing, frowning, bored, interested, angry etc. They will know if an orangutan is happy to see them again – “hey, he recognized me”. They will know if the orangutan is proud when he wins in a memory or pattern recognition game (especially when they see him/her rewarded with food for winning). As people increase their appreciation for and wonder of the animals who share this planet, resistance to destroying the habitats that sustain them will grow. A global awareness of the importance and value of the animals in our world is essential in creating the support and activism required to halt the destruction of the forests. The DeforestsAction team believe this technology will provide an important contribution to that awareness.